Trenton-based artist Leon Rainbow works on a mural at Fotterall Square in North Philadelphia. Nothing you could put your finger on, but as time passed, artist Leon Rainbow noticed that more and more people who were hanging at Trenton's huge Art All Night festival seemed less interested in the art than in each other's business. Rainbow had been painting a mural, but in the early morning he started packing up. That's when he heard the pop-pop-pop of gunshots, he said. For the first time in its 12-year history, Trenton's premier art celebration was unable to ward off the demoralizing chaos of violence. When it was over, a person was dead, another was hospitalized, and a third was in custody charged with weapons offenses. Over 20 people were injured, mostly by gunfire. For Rainbow, it was a discouraging – and scary – experience. For Trenton's well-known portraitist, Mel Leipzig, who didn't participate in this year's event, the incident induced one of those sick-in-the-gut feelings. He knew so many artists there, including graffiti artist Rainbow, a key figure in the resurgence of Trenton's arts community. Painter Mel Leipzig in front of his painting of RAS’ graffiti portrait of — Mel Leipzig. A highly regarded realist painter, Leipzig is joining with street artist Leon Rainbow in a major exhibition at the Lakefront Gallery. Now Rainbow, 42, and Leipzig, 83 — two generations of Trenton artists, joined at the hip by their dedication to art and to the city that has inspired their ambitions — have come together in a joint exhibition at the Lakefront Gallery on the Robert Wood Johnson Hospital campus in neighboring Hamilton Township. It is the Trenton arts community's first organized event since Art All Night, June 16 to 17, which attracted 30,000 visitors, 1,500 artists, and, eventually, the police. Mel Leipzig and Leon Rainbow chat in front of two of their paintings at the opening party for their joint exhibition. "That was terrible," Leipzig said on his living room sofa, a fan blowing, paintings stacked everywhere, the whole little green Trenton house, two blocks from the Delaware River, transformed into a cluttered, humid studio. "Mel & Leon: Paintings by Mel Leipzig and Leon Rainbow" runs through Sept. 5. It wasn't planned to be a response to the Art All Night malaise, but it's bucked up some spirits. "Have some fruit," Leipzig said. "I've got some cheese. Eat." "The thing is," he said, turning again to the shooting at Art All Night, "it's not as bad as people think. I love Trenton. I'll never leave. You sure you won't have something?" Leipzig may not have been at this year's annual festival, the 12th. But he has participated in the past. "My niece talked me into giving a workshop," he said. "I gave a talk, and I painted there. I stayed all night. I couldn't believe it. Then, all of a sudden, I'm painting, and I see the [morning] light coming through the windows above! I tell you, I'm too old. I can't do that again. I came home and slept for 14 hours." "When I tell people I live in Trenton," Leipzig continued, "people make these stupid comments. They say, 'Oh, the only thing I know about Trenton is not to go there,' which is ridiculous." Land of the Free by Leon Rainbow. Mixed media on canvas. One of the paintings in the exhibition. Courtesy of the artist. There are many reasons to venture to Trenton and its environs, and the Leipzig-Rainbow exhibition is one more. Rainbow's larger works in the show, clearly inspired by street art and techniques, are on canvas. He has also included smaller watercolors on paper echoing tags and wall writing. Leipzig, who taught at Mercer County Community College for over 30 years before retiring in 2013, has four portraits of prominent Trenton street artists — Rainbow included — all in front of their creations. In Leipzig's rendering, Rainbow is seated on a bench wearing a black New Jersey writers T-shirt in front of one of his painted walls. Paint drips off the bench, a spray can rests on cracked, pebble-freckled cement. A harsh yellow sky jags in from above. Angles and perspective jab at the viewer like sharp elbows. Mel Leipzig’s 2015 portrait of former student, Leon Rainbow, now one of Trenton’s preeminent graffiti artists. Rainbow was one of Leipzig's art history students in college, and he has learned from Leipzig as a practicing painter. "One of the things Mel taught – you learn and you paint, you make mistakes, you experiment," Rainbow said. "That's what art is. I continually try to develop my style and push myself as far as I can go." Rainbow said he was surprised by the events at Art All Night, which is organized by Artworks, the city's large downtown art center. "Maybe in retrospect, I shouldn't have been surprised," he said. "The Trenton art scene over the last 10 years has been the one thing we've been able to tout, like we're a strong, close-knit, creative place to work." Leon Rainbow at work on a Fotterall Square mural in North Philadelphia. How close-knit is revealed not just by Leipzig and Rainbow coming together at the behest of Sheila Geisler, the Lakefront Gallery curator who invited them to show nearly two years ago. The tightness of the community is reflected in the substance of the art. Leipzig has painted several Trenton graffiti artists over the last few years – part of his broader series of artist portraits. Most of the street artists have been his students in the past. Graffiti artist RAS (Dean Innocenzi) was inspired to return the favor after Leipzig painted him. So RAS sprayed Leipzig over a wall which had previously featured a graffitied portrait of Andy Warhol. Dean’s Marilyn, a painting of Trenton graffiti artist RAS by Mel Leipzig. "I covered Andy Warhol!" Leipzig said with his squeaky chuckle. Leipzig couldn't ignore the opportunity. He then painted RAS in front of his wall mural of Leipzig, adding a little self-portrait in the corner, showing himself in the act of painting the canvas the viewer is looking at. A close-knit circle. Another Leipzig painting of RAS, this one with the artist seated near his wall portrait of Marilyn Monroe, appears in the Lakefront show. "This work is the most vital," Leipzig says of the graffitied walls. "And in eight months it's gone. They have to wipe it off because they need the wall to do others." An innovative Trenton recycling company, TeraCycle, has offered up its walls to the area's graffiti artists, and they make constant use of the brick expanses. A small watercolor, “Rain,” by Leon Rainbow. Courtesy of the artist. "We were painting murals in the streets," said Rainbow. "We've done projects in some of the roughest parts of the city. … We've done Hanover Street, Walnut Avenue. Nobody thought of doing projects in those areas at that time." 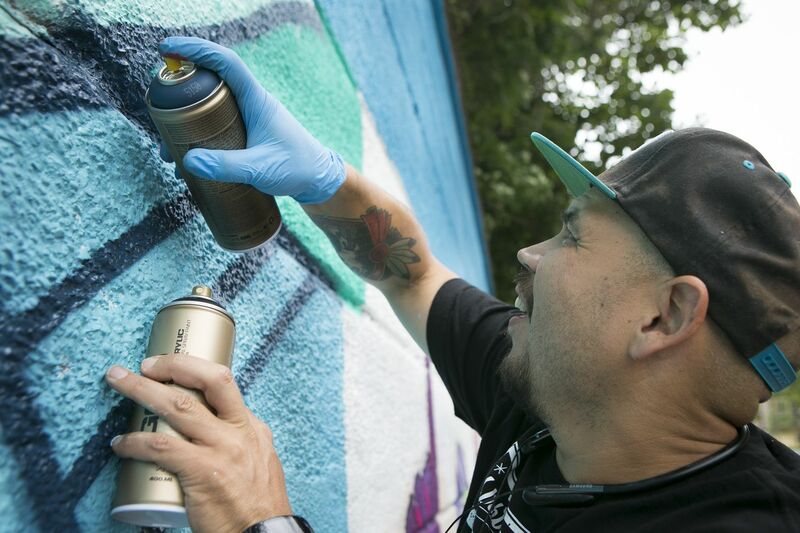 Next month Jersey Fresh Jam, an annual celebration of wall writing and urban arts, cofounded by Rainbow, will open as planned at TeraCycle, with a police presence for the first time, thanks to the shootings at Art All Night. "It's sad," said Rainbow. "People didn't see the 12 to 13 years of all the positivity, all the different types of music, entertainment, food, culture, and revenue that this event has brought to the city. You have a very positive thing, and in an instant it can turn negative. We're somewhat naive in the city. It's one of those things – art was conquering all. It was so close-knit." Painter Mel Leipzig has been painting Trenton’s street artists for the past few years. Several canvases are now at his Trenton home; others are in the exhibition. The gallery exhibition is somewhat of an antidote to the painful events of Art All Night, he said, something to build on. "I feel that this show, I feel it shows the quality and the power of the arts in Trenton," said Rainbow. "With Mel, his influence, seeing how vibrant his work is, seeing how he goes about producing it and teaching. He's brought so much to the table." Leipzig, who retired from teaching at 78 just to paint, is a powerful example to artists in the area. He is an engine of painting, venturing out every day to work from life — whether it's on the street or in studies and studios. Leipzig has works in the collection of the Whitney Museum of American Art and other museums around the country. A hardworking painter and teacher for decades, he has deeply influenced artists in Trenton. But interestingly, he credits them with influencing his own work. "My colors have changed," Leipzig said. "I just put in a red sky in this painting. I couldn't put in a blue sky — it would look ridiculous. All of a sudden I started using more brilliant color." Hanging with graffiti artists can do that. "I started using black," Leipzig said, amazed at his own audacity. "I'm a realist, actually, but I want to use brilliant color now. What the hell. I'm 83 and I'm still learning things about painting. It's unbelievable."